Get yours starting tomorrow at Seattle bakery Cupcake Royale - now with press release! Delicious, local, farm fresh strawberries kick off “Cupcake of the Month” at Seattle’s original neighborhood cupcake bakery. July 31, 2008 – For the entire month of August, Cupcake Royale will be featuring this delicious new seasonal flavor baked with premium, local, farm-fresh ingredients. Skagit Valley Strawberry Cupcakes feature fresh strawberries from Skagit Valley Sun Farms, whipped into a sweet, old-fashioned buttercream. It’s available swirled atop their original vanilla buttercake as well as their all new chocolate cake. All of Cupcake Royale’s cupcakes are baked fresh from scratch daily using local, hormone-free eggs and dairy. 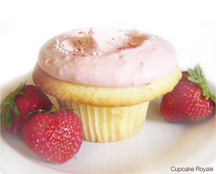 Skagit Valley Strawberry cupcakes are available at all three Cupcake Royale locations and in the bakeries of all six Puget Sound area Metropolitan Market stores for $2.75 each, from August 1st through the end of the month, while supplies last. “Cupcake of the Month” will continue as Cupcake Royale features a new flavor every month made from seasonal, local, natural ingredients.